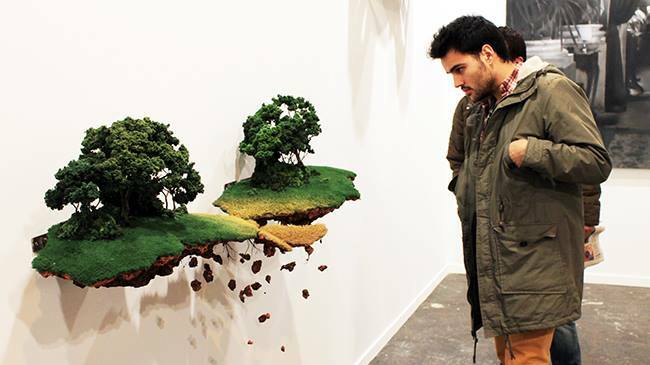 Artist Jorge Mayet sculpts miniature landscapes that look like they’re islands floating in an infinite abyss. The small works, which appear against white gallery walls, create the illusion that they’ve splintered from the ground. Their roots and soil are exposed beneath luscious green grass and tiny homes. While these scenes appear peaceful, some of Mayet’s other artworks aren’t as tranquil. They explode in mid-air as bits of debris hover in the sky. Green painted sponges, paper mache, wire, and cloth all form these minuscule worlds. Separation, destruction, and isolation – on the surface, these themes don’t seem particularly optimistic. But in a recent exhibition at Galeria Inox in Rio de Janiero, Mayet explains that these sculptures aren’t supposed to have negative connotations. Instead, this blast or separation causes things to spread and reach other points. It allows them expand their horizons and travel to new places. Like his work, Mayet left his native Cuba 22 years ago to explore the world, and he landed in Palma de Mallorca, Spain. The sculptures seem to be a metaphor for his vibrant homeland. And wherever he is, his roots are always with him.